You're very organized. I need some of that.lol Your seedlings are looking heathy. Enjoyed reading through your posts applestar. 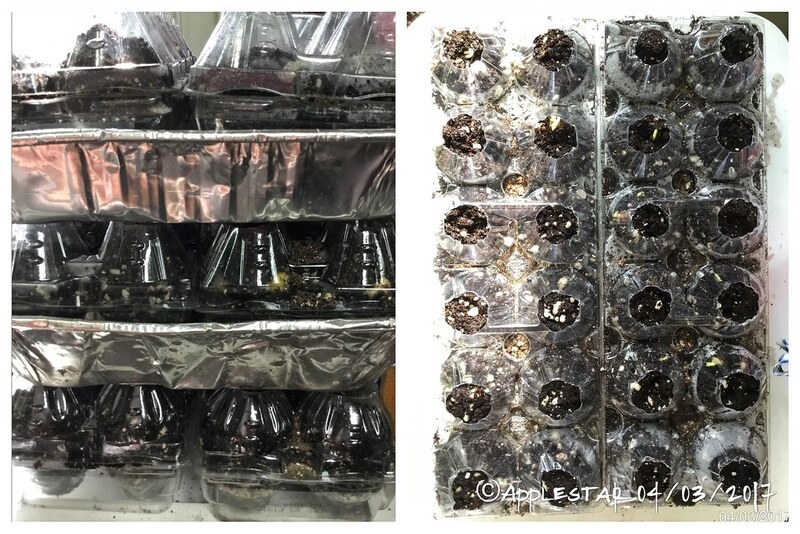 This is the fun part -- I love starting seeds and watching them grow. ...I have to say... I usually do pretty well up to this point. It's the next phase when things get a little hairy. 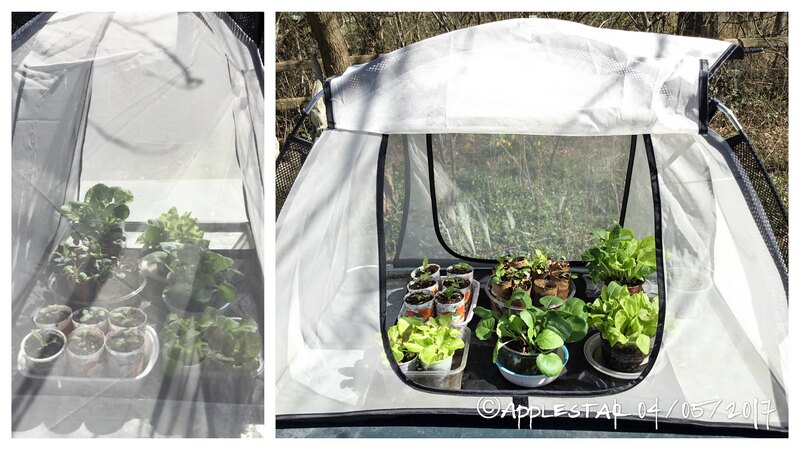 DD helped me to set up the Cabbage Kids Nursery -- I saw a Cabbage White butterfly out and about already. 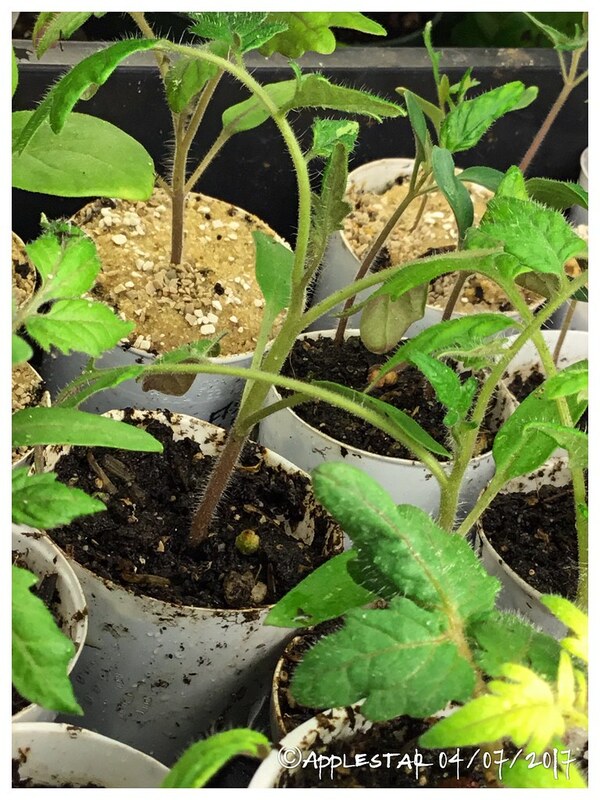 Uppotted another bunch of indeterminate tomato seedlings in 14 paper tube in Rice milk carton. Only since 4/2 but the first one went through explosive growth. 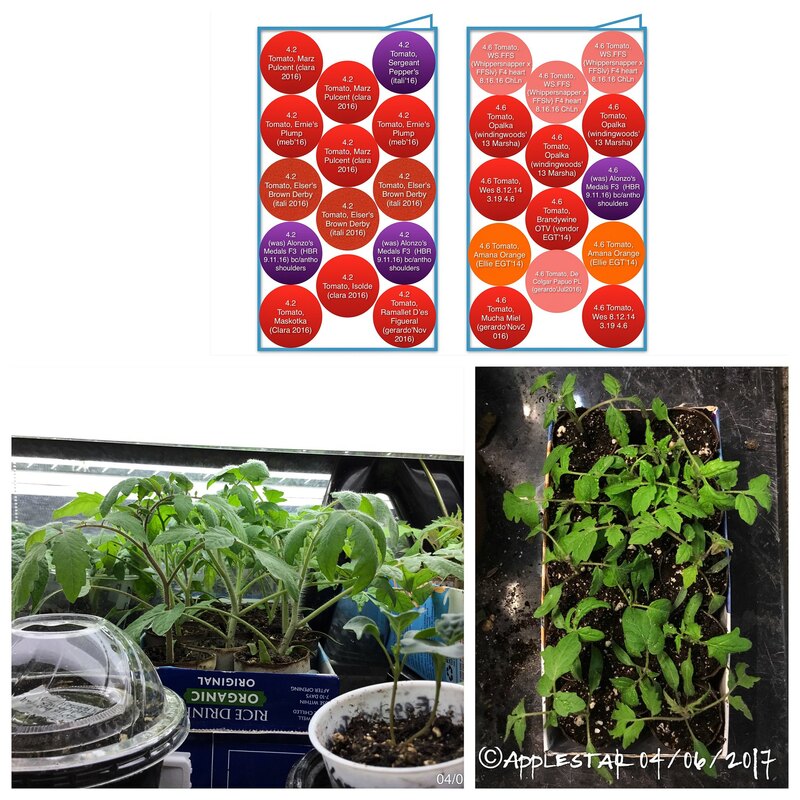 Every year, I think that the K-cup seedlings are like seeds themselves and happily grow into whatever larger containers I put them in. 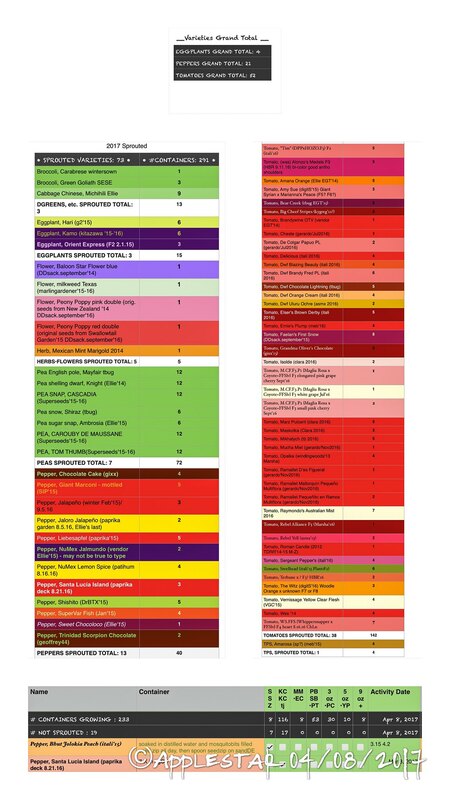 Here's a comparison of the two. The three varieties you can see best in the left photo are antho (purple) stemmed Sgt. Pepper's and the two Marz Pulcent. 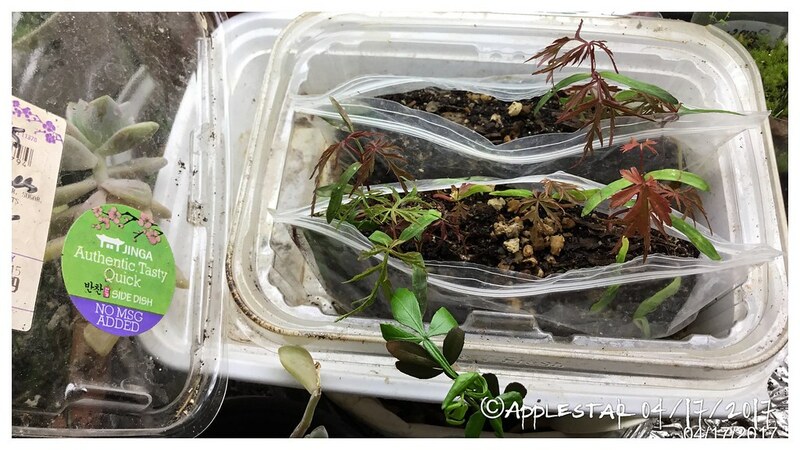 It will be tricky to extricate the tubes of leaf interlocked seedlings later, but I can cut the sides of the rice milk box open for easier access. Compared to these, the seedlings that have been out in the cooler garage V8 temperatures for longer are darker and toughened up more. 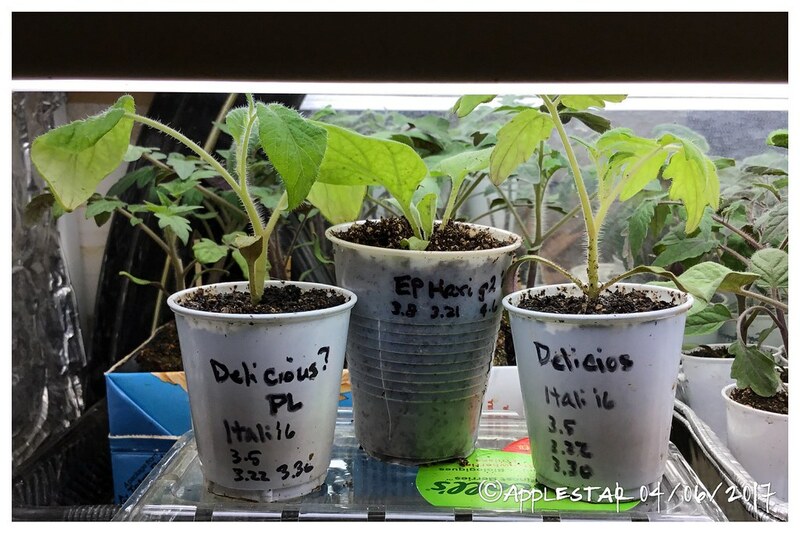 The Pill Bottle Soil Blocks are approximately same size as the paper tubes, small white cups are 3 oz, and the larger clear cups with my oldest dwarf varieties are 9 oz. 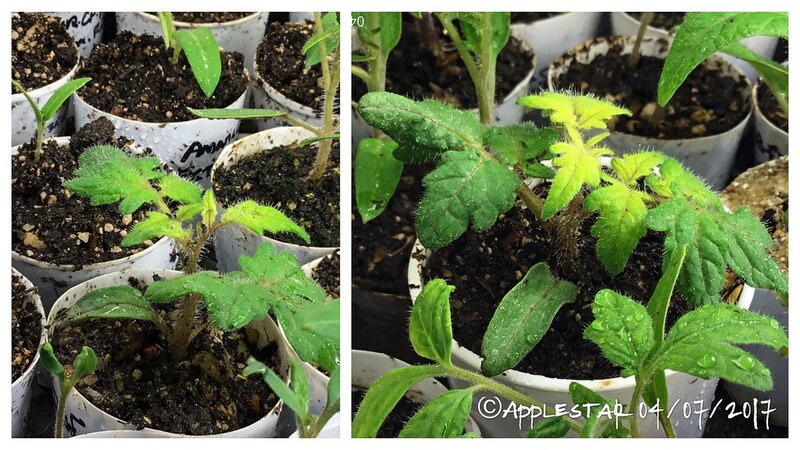 I have something odd going on with the Delicious seedlings -- one of them is a PL (potato leaf). Maybe an accidental cross? The eggplant Hari is in a 5 oz cup. ... I just brought these out to the V8 Nursery today as well -- so the foliage is soft and lighter green like the new rice milk group. Not sure why these and ONLY these two Dwarf Chocolate Lightning seedlings have these lighter colored new leaves. ...according to my notes, I have 5 of these -- 2 more in 9oz cups which are in the Garage V8 and 1 more KCup -- somewhere... I'll have to go find them tomorrow and see if they look the same. -- just realized the 9 oz Dwf Chocolate Lightning is in the front in the pic I posted yesterday, and it looks all green. Maybe these two are in that faulty mixture I managed to make. I'll repot them in a fresh mix tomorrow and hope for the best. 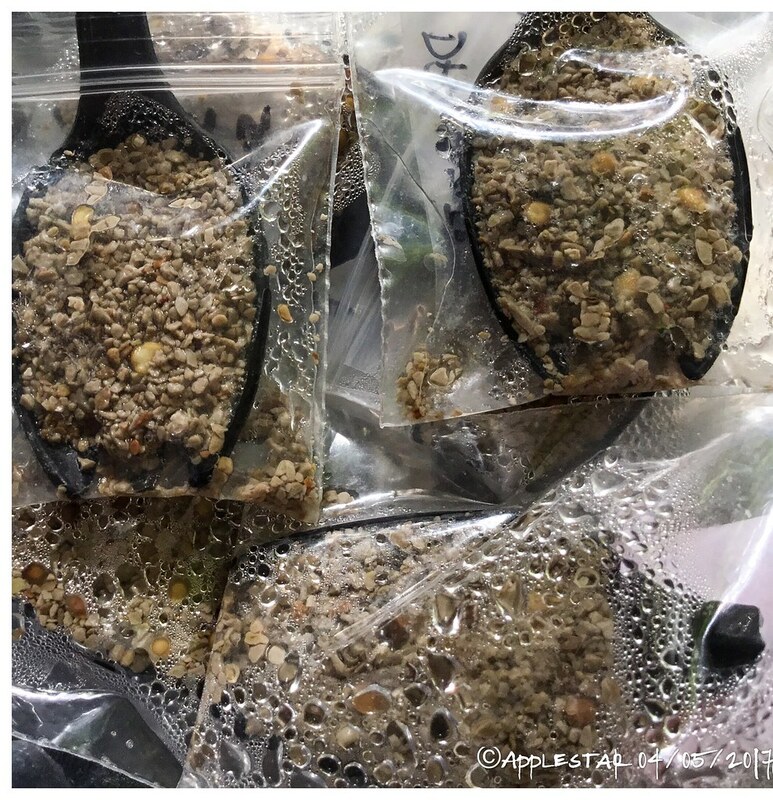 Newest babies to join my expanding citrus family collection -- a friend sent me a fully ripe key lime fruit from her tree when I mentioned wanting to try growing from seeds and lamented that I couldn't find any in the stores and the produce guy said maybe in the summer time. How do you keep track of it all? How do you have enough room when setting stuff out? I'm in awe! I have maybe one tenth the variety of stuff that you have, but invariably I still get stuff mixed up! 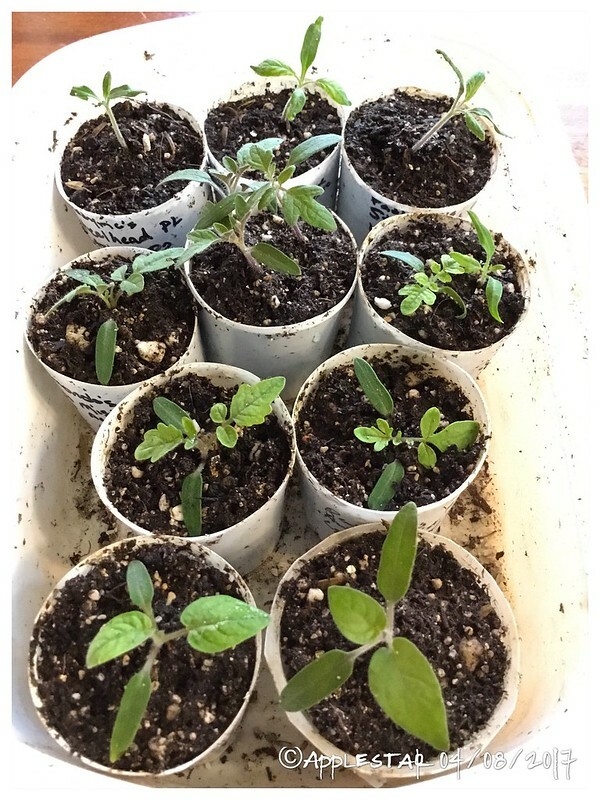 Seems like every year some of my tomato seedlings get that yellowing too while in the little pots. Seems like Rutgers are most prone to that for me. They always seem to get over it when uppotting and setting out. I use a spreadsheet and a tablet. ...I ignore the space and practicality issues. In this phase, it's all about whether I can grow them at all. 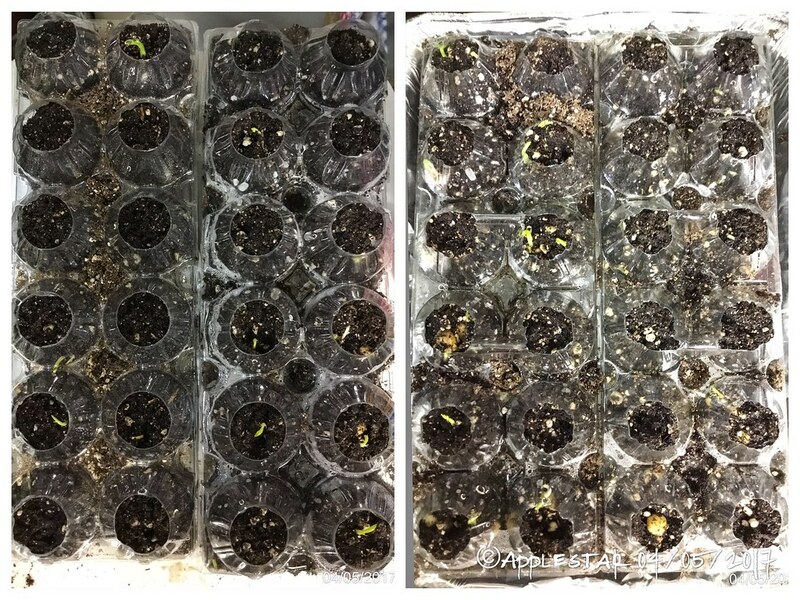 I really enjoy seeing them grow from the ittybitty seeds, and seeing the variations even in the seedlings stage. 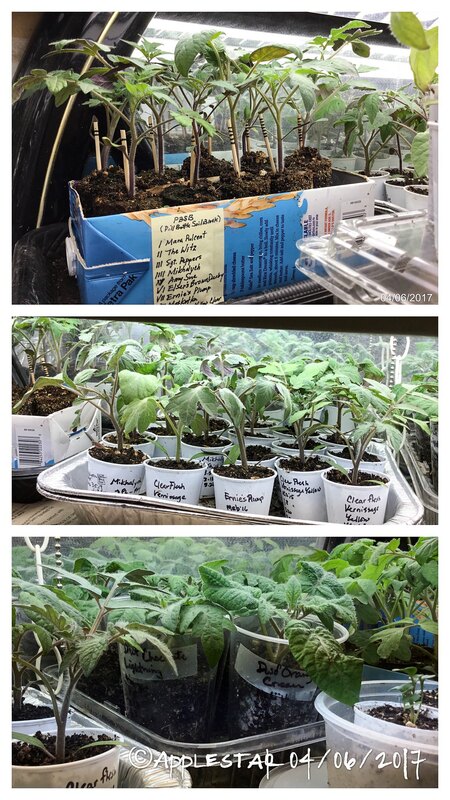 They are all precious and I am rolling my eyes at the already ridiculously large numbers while lamenting that some of the coveted varieties haven't sprouted. There are still things that can happen. I'll regret it if I don't grow extras and back-ups, I like having extras to give away, and I just have to deal with the excess if I grow more than enough and they all survive. Also, this way, I will have a selection of plants to choose from and the healthiest to plant out. 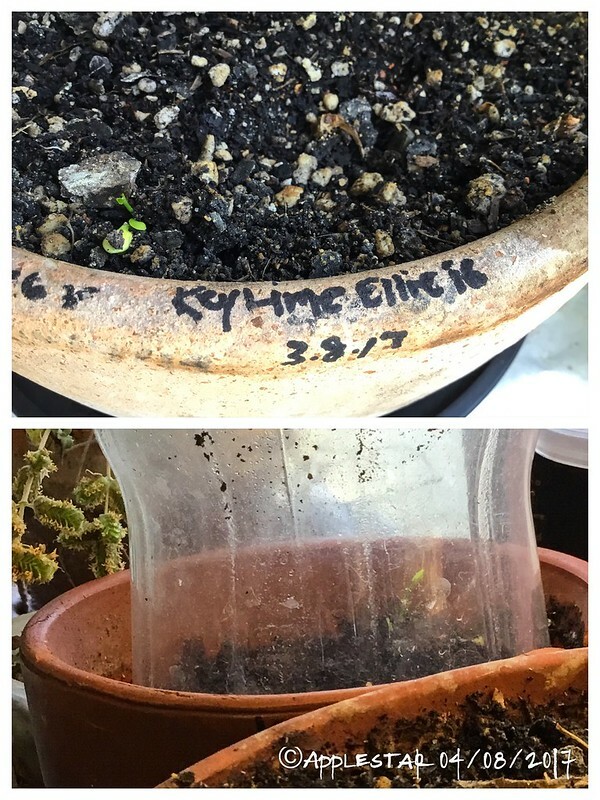 In addition to the Key Lime seeds that sprouted, it turned out that more things have been sprouting just in the last couple of days. Isn't it odd? I wonder what the signal was? 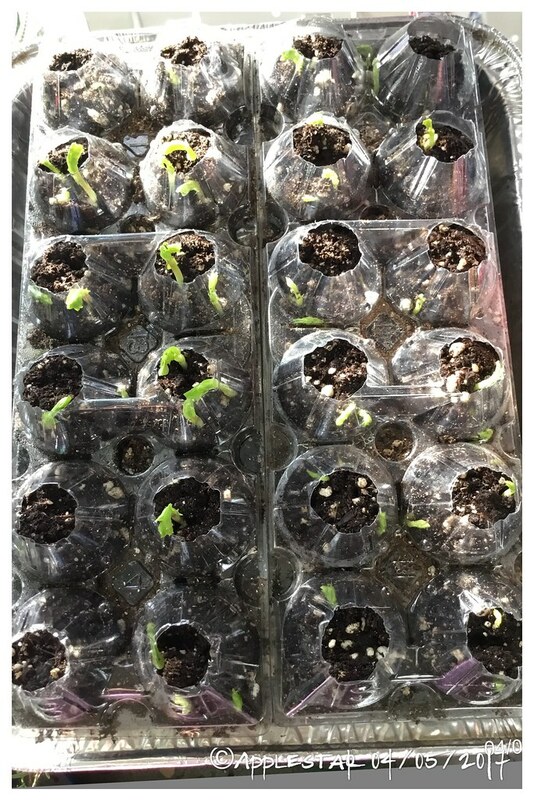 I removed the cover of the container and opened the zip bags and gave them a bit of water, then put them under the V8 lights. Maybe some of them will survive? 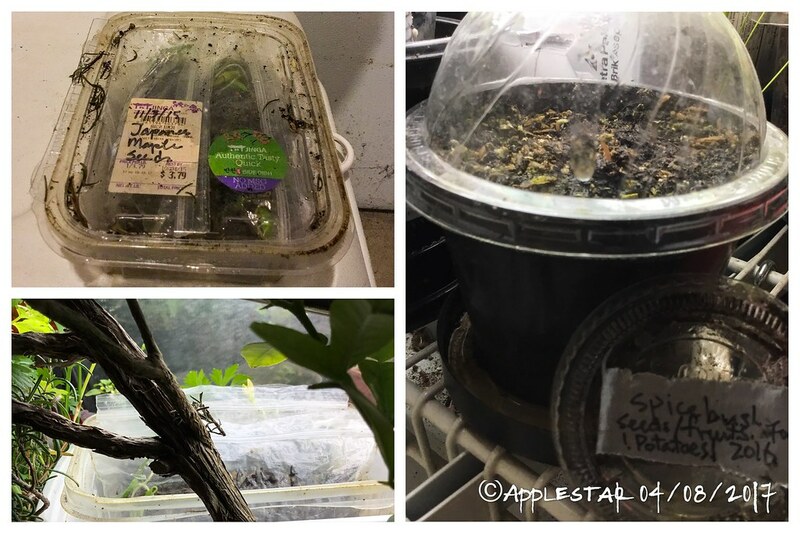 The photo on the right is the pot of sprouted spicebush seeds (thanks !potatoes! ) I took them out of the fridge stratification and had them under the lights. I peeked under the condiment lid which had been flat on the surface of the potting mix and discovered these little sprouts. 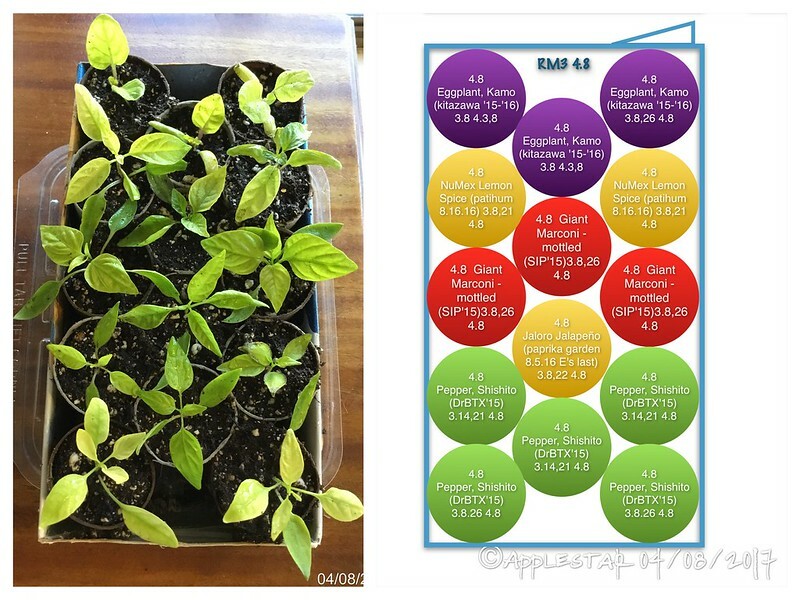 Repotted, separated, and Uppotted all the yellowed peppers, eggplants, and tomatoes. The mix was wet and stinky/anaerobic. Roots were stunted. Also separated many of the community started Kcups. 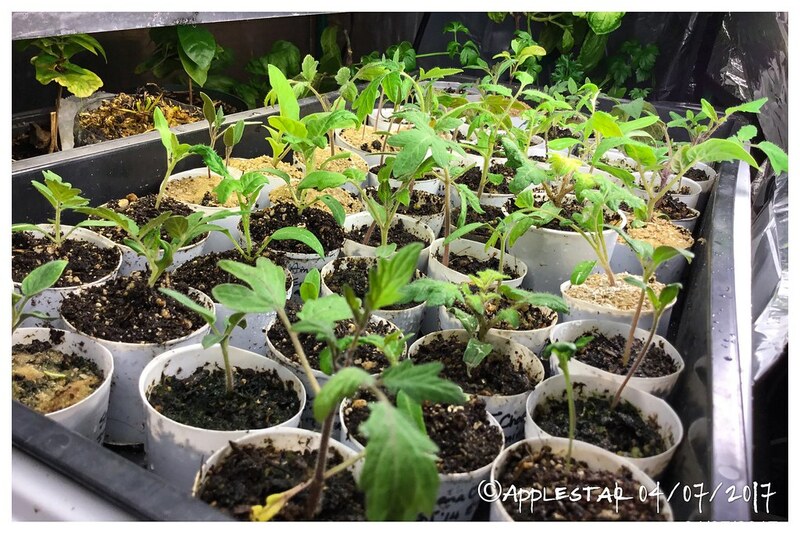 TOP 3 --Paddymc's cross Steelhead (Itali'15 Plant 2 -- GWR with red core) -- seeds were from last year.